In a large mixing bowl, combine butter and both types of sugar until smooth. Add vanilla and egg, mix until smooth. Add salt, cinnamon, and nutmeg, mix until smooth. In a small bowl, combine half the flour and all the baking soda. Gradually add flour mixture to the dough. Continue to add remaining flour slowly. If your dough starts to become “dry” before you finish, stop with the flour and move on. Mix in oatmeal. Fold in chocolate chips and other optional ingredients. Spoon out dough by large tablespoonfuls onto prepared cookie sheets, leaving at least 2 inches between each cookie. Bake until cookie edges turn golden brown, about 10-12 minutes. Cool 1 minute on cookie sheets before moving to cooling rack. Super moist deliciousness. Was it the cooked oatmeal? The shortening? I’m not sure, but my cookies were super soft, whether in the oven for 10 minutes or 18 minutes. They looked “undercooked” when I pulled them out at 13 minutes, but I found that 13 was definitely the magic number. 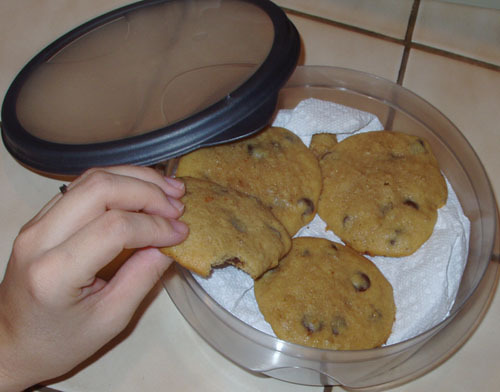 Be sure to let these cool on the cookie sheet before trying to move them, and if you’re using chocolate chips, make sure your spatula is tough enough to scoop the cookies off without ripping them in half. In a large mixing bowl, combine butter and both types of sugar until smooth. Add vanilla and egg, mix until smooth. Add peanut butter, mix until smooth. In a small bowl, combine salt, baking soda and one cup of flour. Gradually mix into peanut butter mixture. Continue to add remaining flour until the cookie dough is no longer sticky. If your dough starts to become “dry” before that, stop with the flour and move on. If your dough still feels sticky, you may need to refrigerate the dough before trying to shape into balls. Do not add extra flour until after you’ve baked one round and only then if your cookies come out super flat. Whenever I add too much, I get crumbly cookies!! Roll the dough into small balls and dip them in sugar. With sugar side up, place on cookie sheet and gently create a criss-cross pattern with a fork or prongs on top. Since my step-dad has missed the visits this year, I went ahead and made these without him. I messed up on something, I really don’t know what. 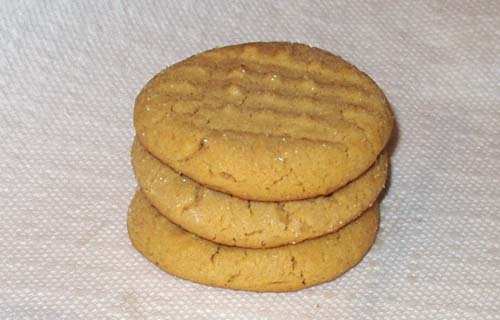 I think it’s time for a new peanut butter cookie recipe. They had a great flavor, the perfect height, softness, chewiness and feel I wanted, but they fell apart!! I think my butter was too warm (melty), but I’m not sure. 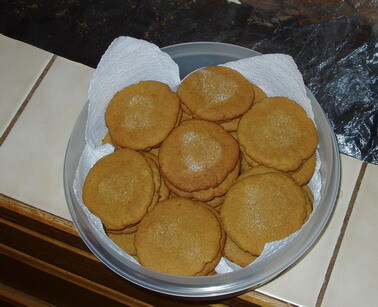 Molasses cookies! Crazy, I know! But they make the best ginger cookies. Straight from the back of the jar. Beat butter with sugar and molasses. Mix in egg. Sift dry ingredients and add to wet mixture. Mix well. Chill in freezer 1 hour or in refrigerator 2 hours. Heat oven to 350ºF. Roll out a portion of the dough 1/4-in. thick on lightly floured board. Chill remaining dough. Cut with cookie cutter, place on greased baking sheets. If decorating with raisins, add them at this time. Bake 8-10 minutes. Cool. Pipe on royal icing and add candy pieces, if desired. 3. Refrigerate dough for at least 40 minutes. 4. Shape dough into walnut sized balls, and roll them in the remaining 2 tablespoons of sugar. 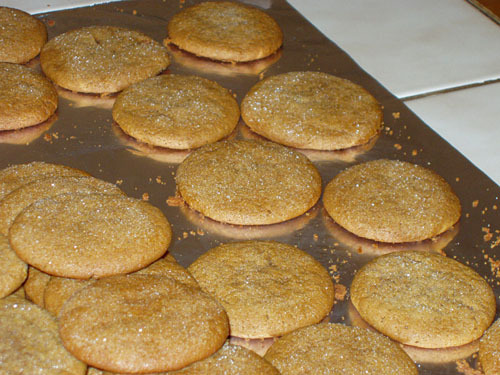 Place the cookies 2 inches apart onto an ungreased cookie sheet, and flatten generously. 5. Bake for 8 to 10 minutes in the preheated oven. Allow cookies to cool on baking sheet for 5 minutes before removing to a wire rack to cool completely. Store in an airtight container. Here’s a recipe for you: always a holiday hit around our houses. These are technically Mexican Wedding Cakes or Russian Teacakes, but we call them snowballs or melt-in-the-mouths! Original recipe makes 5-dozen (30 servings). Cream the butter with 1/2 cup of the confectioners’ sugar and the vanilla. Mix in the flour, nuts and salt. Roll about 1 tablespoon or so of dough into balls and place on an ungreased cookie sheet. Bake at 350 degrees F (175 degrees C) for 15 minutes. Do not allow these cookies to get too brown. It’s better to undercook them than to overcook them. 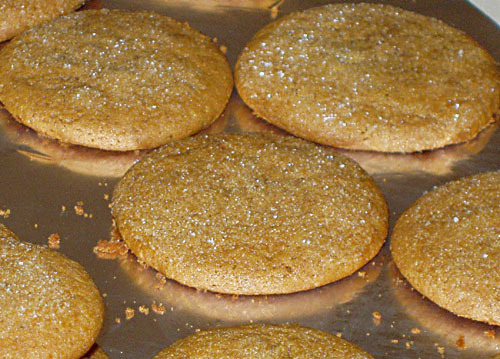 While cookies are still hot roll them in confectioners’ sugar. Once they have cooled roll them in confectioners’ sugar once more. Combine all ingredients except filling. Place half in the bottom of a 13×9 — packing down with a spoon — place in filling and then crumble the rest of the dough mixture on top. Bake at 375 for 30-35 minutes.